In a new report published this week scientists from leading UK and Norwegian research institutions highlights the urgency to further investigate the least understood regions on Earth. "The polar oceans have long been amongst the least explored and least understood regions on Earth, yet they exert a profound influence over all of the planet. 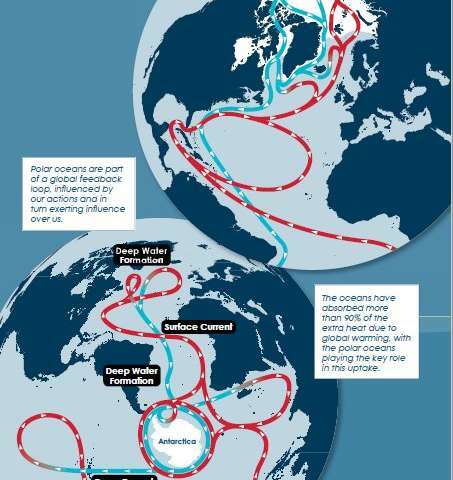 What happens in these oceans directly affect the lives of its inhabitants. Recent advances in measurement techniques and our ability to create computer simulations of ocean processes gives us new insight into how they are changing. "We are beginning to understand what those changes mean for climate, sea level, for the marine ecosystem as well as for humans and society. This report highlights the state-of-the-art science behind those changes and their implications, and stresses the need for ongoing sustained observations of these key regions of the Earth System". The polar oceans sustain millions of seabirds, whales and fish, from penguins in the south to polar bears in the north, as well as providing food for a hungry world.